Uh, oh... This looks bad. Zogby is pretty good about this stuff. One of the country's top pollsters was in Rochester on Thursday and suggested that the November presidential election will end in an electoral landslide, even though the candidates are running close. 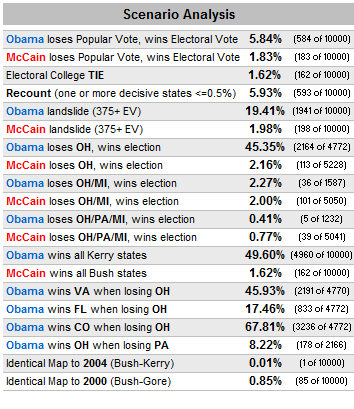 [+3] - LionTamerX - 09/27/2008It is still a little far away, but all the key indicators are predicting a fairly huge Obama victory. Maybe not a Johnson over Goldwater landslide, but something akin to a Reagan over Mondale. FiveThirtyEight.com shows close to a 20% chance of a blowout based on current polls. If you look at the six or seven states on the fence, if they all fall one direction, you have a whopping electoral win even if the polular vote is still close. Do you think more Americans are beginning to wake up from their stupor? I can't believe that it's a head-to-head contest after they heard Palin talk about her "foreign experience" yesterday. But in politics, you never really know. My wife told me this morning that Palin's popularity is still "way up there!" How many people actually watched that interview? If you're interested in politics, maybe, but I think a lot of people who needed to see it weren't watching. I understand about the conservative's selective viewing and memory, but they played that interview quite often yesterday. Even a child could have memorized what Palin said about her foreign experience. Saw the interview on the telly several times on this interview. What I don't understand is why she still enjoys the support of conservatives. Do you? a word that denotes the citizens disgustment. But in USA neither Dems nor the Reps( two alternative) had enthused the citizens to give a befitting third choice. I had never been to usa but well informed about the system. Some of you vote and chat in this forum. But none of you can be satisfied with the outcome. Some people are in denial of her incompetence, so they aren't listening no matter what she says. Some don't know any better themselves so she sounds reasonable to them. Some don't care because she's just the VP. Some are focused on charges of sexism and won't pay attention to anything else. Some like her other philosophical stances so much that they don't care what she knows about being VP (or possibly Pres). Add all that together and you get a decent chunk of the republican base. A good case of the blind leading the blind and the blind leader leading the blind. It is still a little far away, but all the key indicators are predicting a fairly huge Obama victory. Maybe not a Johnson over Goldwater landslide, but something akin to a Reagan over Mondale. Your prediction may turn out to be true, but we still enough time before election day for anything to happen. Intrade is reflecting a tanking confidence in McCain as well. Theoretically, this first debate was his best opportunity to gain ground... and he lost some instead. Tough to interpret the real result though, because the opinion may be reflecting disdain for his idiotic political stunt (bogus campaign suspension)(was surprised to see you defend that nonsense, despite your politics). It is possible that the stunt, not the debate, is causing his current drops. In which case the next two debates could bounce him back. I doubt it though. I think he was only barely outperformed by Obama, but think he'll fair worse in the next two. I further think Palin is severely overmatched by Biden, think that debate will attract a huge audience... and unless she was doing a rope-a-dope with Couric; she is going to be severely, embarrassingly, exposed. I think McCain is in trouble... but then…we don't yet know what kind of last minute non-issues will become the premier issues. OBill, Good analyses thus far, and I'm also unsure of those "last minute non-issues becoming premier issues" as we've observed thus far in this campaign. Hm - I'd be sceptical. Nothing wrong about the (regular) Zogby polls (though the internet-based ones are a different story). But when it comes to the prostognations of Mr. Zogby himself, take them with a grain of salt. He was the one who in 2004 predicted that Kerry would win easily - and he did so right on the eve of the elections, when the polls had Bush in a narrow lead. Yeah, found this: "At 5:30 p.m. on Election Day, Zogby’s Web site had Kerry with a projected total of three hundred and eleven electoral votes, a blowout." Again, this was a projection, rather than a poll; Zogby's last actual (daily tracking) poll out had had Bush with a 1-point lead. Apparently the Zogby Co.'s polling is more reliable than Zogby's personal projections - which makes sense. Everyone can have an opinion about how things will turn out ... while the polls go on actual data.